The site is promoted strongly in the major search engines and thousands of people view the site every day. The ad space is category specific which means that if you want to target visitors looking for a particular type of accommodation or event, or perhaps people looking at information about a particular area then you can. Targeting visitors in this manner provides an increase in the response from you advert due to the greater relevance of your advert to the audience that are viewing it. Take advantage of the Top Ad Banner or the Right Ad Banner on the right of the page. 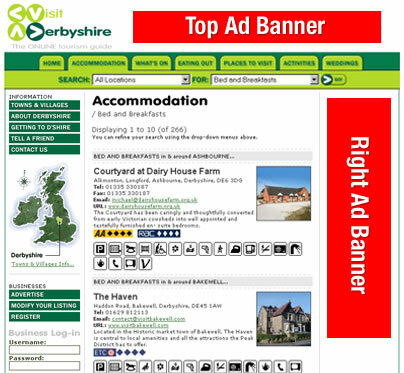 The banner advertising starts from as little as £100 a year and we can guarantee you will receive more exposure for your business and more traffic through to your website.